This has got to be one of my best Mac n' Cheese attempts! So oozy, creamy cheesy! The secret I've found to making a really good mac n' cheese is to used smoked cheese! It really adds an incredible depth. I believe I've mentioned in my last Mac n' Cheese post that I have been on a mission to create the most perfect Mac n' Cheese. I have made several and they are certainly delicious and different every time. This one is definitely going on my list of tip top Mac n' Cheese. Meanwhile, melt the butter in a saucepan , stir in the flour and cook on low-medium for about 1 minute, stirring constantly. Remove from the heat and gradually stir in the milk. Bring to a boil, then reduce heat again and stir in the smoked cheese and continue to stir until the sauce thickens. Season with salt and pepper, a pinch of nutmeg and stir in the mustard powder. Drain your pasta and mix together with the sauce and 3/4 of the cheddar in a casserole dish. Top with the remaining cheddar then the breadcrumbs. This is definitely not the first entry of Mac n' Cheese for Presto Pasta Nights but it is also definitely not the last! So many people love this dish and this particular version should surely be shared!! 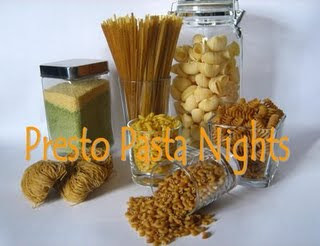 This week is the 150th Presto Pasta Night!!! Well done everyone and a special thanks to Ruth from Once Upon a Feast! This week is hosted by Susan of The Well Seasoned Cook. Thanks Susan! Sarah, what a perfect dish to celebrate Presto Pasta Night turning 150! As for Mac 'n Cheese dishes...always a star especially during the winter and I agree, this one sounds awesome. Bavarian smoked cheese...scrummy! Thanks, Sarah, for your great PPN recipe. Oh my gosh I think I'm in love! This looks fantastic! You're right...there is no such thing as too much mac and cheese. Thanks for the smoked cheese tip! I loving this mac and cheese. Thanks everyone (TheFoodHunter, Ruth, Joanna and Susan) for your nice comments. Just getting your comments makes me want to make more Mac n' Cheese this very second!! OMG... that looks so good I can't stand it!